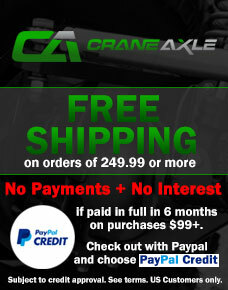 For those looking to upgrade their Dana 44 cross-over steering assembly, get extreme durability and performance from Crane Axle. We build all of our axle parts with the highest quality materials available and machine them to extreme accuracy in our state-of-the-art fabrication and manufacturing facility. Right in the heart of a large 4x4 community in Murfreesboro, TN. Crane Axle's Cross-Over steering kit includes: (1) Right Hand (passenger) Extreme Duty Interlocking Outer Knuckle,(1) Interlocking High- Steer arm and (1) 5/8" stud/cone kit. This kit is designed when basic steering correction is needed. Crane's Extreme Duty Interlocking outer knuckle is made from High Strength Nodular Iron. The High-Steer arm is built from 1018 CR steel for superior strength. The interlocking design is a Crane original! You can say goodbye to broken high-steer arm studs now that the interlocking key is carrying the load. Crane's outer knuckle fits: GM, Ford, Dodge, CJ and Fullsize Jeep Dana 44 and GM 10 bolt front axles from 1/4 ton to 3/4 ton. Most applications are direct bolt on replacements. Some may require caliper bracket, spindle and caliper changes. Crane's steering arm is piloted with 1/2" holes for ease of locating tie rod and/or drag link holes. They can be tapered to run 3/4 & 1 ton tie rod ends. They can also be drilled to run 5/8" or 3/4" rod ends. Complete Cross-Over Steering Kit: Includes - (1 Driver and 1 Passenger Knuckle, 1 Driver and 1 Passenger Steering Arm, 2 Stud Kits), allows you to have Crane Axle performance and durability on your entire cross-over steering axle.